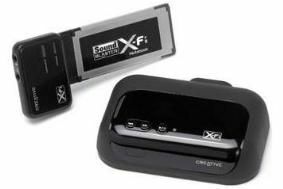 Creative's Sound Blaster X-Fi delivers wireless laptop sound | What Hi-Fi? The card fits in to any standard ExpressCard slot and then sends any audio, including from iTunes, to the wireless receiver. Connect this to a pair of powered speakers or standard hi-fi system to have your music whizzing from one room to another. As many as four individual zones can be created by adding further receivers, delivering a multiroom solution for relative peanuts – the sound card and the receiver will be priced at £60. Lest you forget, the X-Fi Sound Card aims to improve the quality of your PC sound, too, enabling gamers to more accurately place exactly which direction they're being shot to pieces from, which is nice. The sound card will be available at the end of September, with the wireless receiver to follow in October.